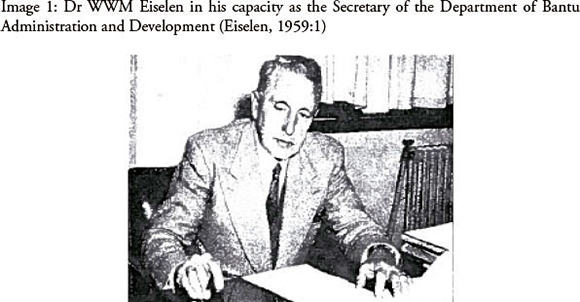 In 1949 the government appointed the Eiselen Commission with the task of considering African education provision. The Commission recommended ‘resorting to radical measures’ for the ‘effective reform of the Bantu school system’. In 1953, prior to the apartheid government’s Bantu Education Act, 90% of black South African schools were state-aided mission schools. The Act demanded that all such schools register with the state, and removed control of African education from the churches and provincial authorities. This control was centralized in the Bantu Education Department, a body dedicated to keeping it separate and inferior. Almost all the mission schools closed down. The Roman Catholic Church was largely alone in its attempt to keep its schools going without state aid. The 1953 Act also separated the financing of education for Africans from general state spending and linked it to direct tax paid by Africans themselves, with the result that far less was spent on black children than on white children. In 1954—5 black teachers and students protested against Bantu Education. The African Education Movement was formed to provide alternative education. For a few years, cultural clubs operated as informal schools, but by 1960 they had closed down. The Extension of University Education Act, Act 45 of 1959, put an end to black students attending white universities (mainly the universities of Cape Town and Witwatersrand). Separating tertiary institutions according to race, this Act set up separate 'tribal colleges' for black university students. The so-called ‘bush’ Universities such as Fort Hare, Vista, Venda, Western Cape were formed. Blacks could no longer freely attend white universities. Again, there were strong protests. Expenditure on Bantu Education increased from the late 1960s, once the apartheid Nationalist government saw the need for a trained African labour force. Through this, more African children attended school than under the old missionary system of education, albeit grossly deprived of facilities in comparison with the education of other races, especially whites. Nationally, pupil:teacher ratios went up from 46:1 in 1955 to 58:1 in 1967. Overcrowded classrooms were used on a rota basis. There was also a lack of teachers, and many of those who did teach were underqualified. In 1961, only 10 per cent of black teachers held a matriculation certificate [last year of high school]. Black education was essentially retrogressing, with teachers being less qualified than their students. The Coloured Person's Education Act of 1963 put control of 'coloured' education under the Department of Coloured Affairs. 'Coloured' schools also had to be registered with the government. 'Coloured' education was made compulsory, but was now effectively separated from white schooling. The 1965 Indian Education Act was passed to separate and control Indian education, which was placed under the Department of Indian Affairs. In 1976, the SAIC took over certain educational functions. Indian education was also made compulsory. Because of the government's ‘homelands’ policy, no new high schools were built in Soweto between 1962 and 1971 -- students were meant to move to their relevant homeland to attend the newly built schools there. Then in 1972 the government gave in to pressure from business to improve the Bantu Education system to meet business's need for a better trained black workforce. 40 new schools were built in Soweto. Between 1972 and 1976 the number of pupils at secondary schools increased from 12,656 to 34,656. One in five Soweto children were attending secondary school.